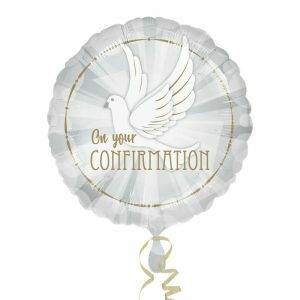 This 18" foil balloon is decorated in white, with gold detailing, the balloon features a beautiful flying Dove and the message 'On Your Confirmation'! The balloon is supplied uninflated in retail packaging, suitable for inflation with air or helium. Team with the matching range for a lovely celebratory party table! 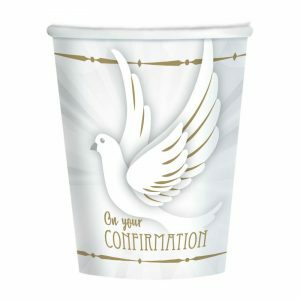 These 250ml paper cups are each deocrated in white and gold featuring a beautiful flying Dove and the message 'On Your Confirmation' printed beneath, finished with gold borders. There are 8 cups supplied per pack. 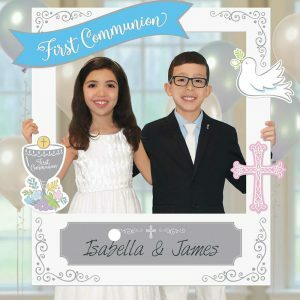 Great to team with the matching range for a lovely Confirmation theme! 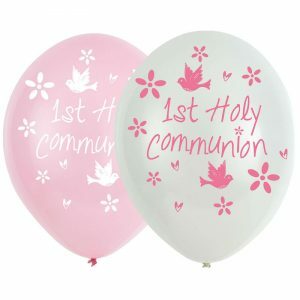 Great for a Communion celebration, these balloons say '1st Holy Communion' in the centre with an all-around doves and flower design on a pink balloon. The balloons have a pearlescent finish and will add an elegant touch to the occasion. The balloons can be filled with air or helium but will require helium to float. Supplied uninflated.